In 1921, Father A.J. Fleming saw the need to establish a school for the St. Isidore parish community. From the Sisters of St. Joseph in Chestnut Hill, Mother Marie Amiee, Sister Rose Aloysia and Sister St. Benedicta traveled to become the first staff of St. Isidore School. By the first day of school on September 6th, 1921, thirty-eight students were registered. During this time, Father Fleming moved to another house so the rectory could serve as both school and convent. 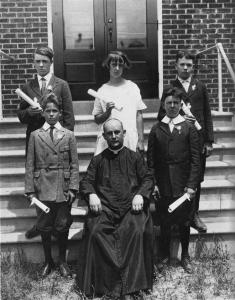 On November 16th 1922, the new pastor, Father Thomas Harron oversaw ground breaking on both a new school and convent for the Sisters. Construction for both buildings was finished in early April 1923. This initial building has been remodeled many times and is still in use today, primarily by the Early Childhood Division. What is now the main school building was built at a cost of $225,000 and opened in 1963. This building contains the Elementary School, the multipurpose gymnasium/cafeteria/auditorium, kitchen, and administrative offices. In 2010, the old church building was remodeled to contain the Middle School classrooms and other resource areas including the computer lab and library. The school upgrades technology and other physical plant infrastructure every year. 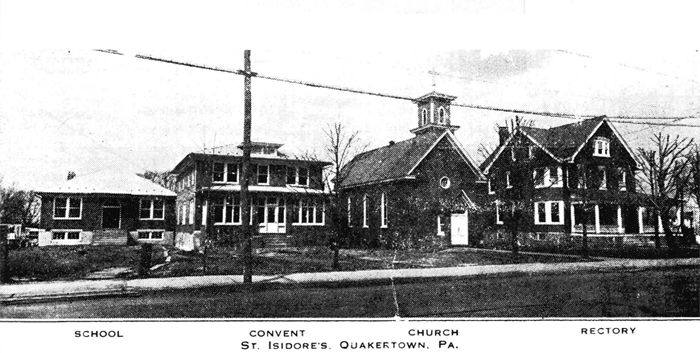 Information adapted from “Saint Isidore of Madrid, Quakertown, PA, 1886-1986,” a book published for the church centennial.